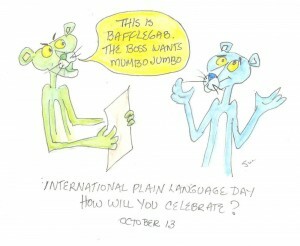 I’m writing this on the evening before the first annual International Plain Language Day. I’m writing carefully, crossing out words like ‘unambiguous’ and ‘unlawful’ and replacing them with ‘clear’ and “a crime.’ Even for a dedicated clarity crusader, it takes some conscious effort to write simply. On October 13, 2010, the United States passed the Plain Writing Act. This law means the US government has to promote “clear Government communication that the public can understand and use.” Around the world, people in the clear language movement got excited. It looked as if a big, powerful, influential nation was making it a crime to confuse people, at least in writing. It was a signal that gobbledygook, bafflegab, legalese, corporate speak and mumbo jumbo might be on the way out. Back in the 1970s, Citibank translated its loan contracts into plain language. They were making people sign legal documents, why not help people understand what they were getting into? The Canadian Bar Association and the Canadian Bankers Association joined the movement. Soon financial contracts, insurance policies, residential leases and other documents could be read without a lawyer standing by to translate. I stumbled upon plain language in university. Not in the classroom, likely the last place we’ll find it, but in volunteer work. I was working with students who were almost old enough to drop out of school but could not read. They struggled with books written for their age level. They couldn’t read cereal boxes, instructions and government forms. Books written at their reading level – “See Spot run and jump” – were of no interest to teens. So I wrote stories for my students. As I wrote, I noticed that I had learned to write ‘fancy,’ rather than ‘plain’ and had to work my brain hard to keep things simple. Why was that so? I was the product of a good education. Wonderful teachers worked hard to polish our writing, in two official languages. They taught us to create complex sentences out of simple ones. Adverbs, adjectives, similes, metaphors, tenses, footnotes and commas in the right places earned us gold stars and high marks. So we threw them all into our writing, along with other goodies from the grammar books. We were going to sound smart. And we did. But sounding smart isn’t always smart. Today, we know that many people can’t understand what we write. They may lack education, reading ability, English skills or interest. We aren’t reaching them when we use big words and complex sentence structure. To be better understood by more people, we need to sound clear. That’s smart. Those are just three of many techniques to make your writing clear. They’re my favourites since they deliver a lot of understanding for a little work. Use them to celebrate International Plain Language Day – or any day you happen to be writing. Here’s a link to some plain language resources.